There’s an emerging view among iOS(s AAPL) developers that both the amount of work involved and value created by app development merit higher prices for apps. But a new study shows that developers test pricing tend to lower the price of their apps — or even charge nothing at all. New research published Thursday from mobile analytics firm Flurry, which looked at app pricing over the past four years for 350,000 apps using Flurry’s mobile analytics service, found that developers are charging less for their apps over time, and many times, end up going completely free. (The results are weighted to account for number of users for each app.) The result is more ad-laden apps. But Flurry says purchase habits show that user demand is higher for apps that will cost them nothing, even if there are ads as a result. Since 2010, when free apps accounted for 84 percent of those Flurry tracked, the percent of apps charging nothing — and using ads to drive revenue instead — dropped briefly to 80 percent, before rising in 2012 (back to 84 percent). As of April this year, 90 percent of all apps are free and ad-supported. 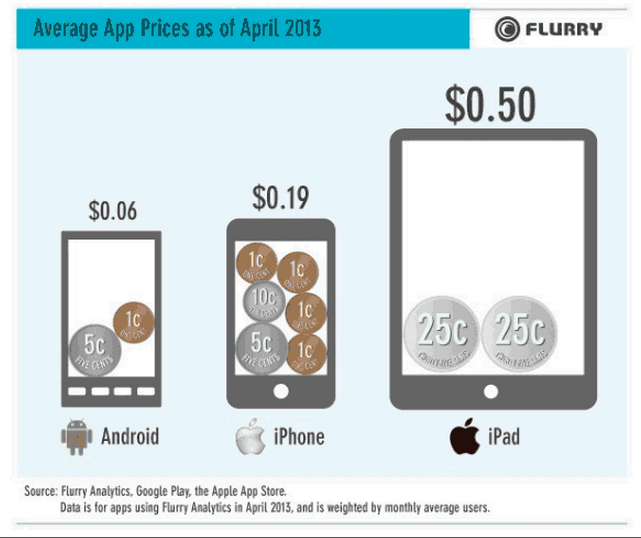 As a result, the average price of an app continues to drop. We looked at historical iOS app data (again because iOS apps have a longer history) to identify apps that have been the subjects of pricing experiments. That typically took the form of A/B testing, where an app was one price for a period of time then the price was raised or lowered for a period of time, then raised or lowered again. This lets developers assess users’ willingness to pay (i.e., price elasticity of demand) based on the number of downloads at different price points. App Store pricing has changed since its debut in 2008. Today, developers are competing for users against 900,000 other apps for sale, and they have to find ways to stand out. As Flurry has shown, charging for downloads is increasingly becoming less attractive to users, and especially as smartphones and tablets begin selling in larger quantities in emerging markets where customers may have even less discretionary money to spend on apps, the price of apps is likely to continue to drop even further. Really ipad and iphone apps are priciest than android apps with more demand of android apps because android OS is used by more mobile companies so, demand of android is more and cheapest than ipad and iphone apps. Does it include in-app purchases in their calculations? If you look at the top-grossing apps on the App store, the top 10 are all free to download, but in-app purchases put them in the top grossing.